As we've noted before, a solar eclipse can only occur at the start of a Hebrew month, as the moon gets between the sun and the earth. A lunar eclipse is also linked to the Jewish month, and can only occur around the 15th day of the month, when the moon is full. As the earth passes between the sun and the moon, its shadow is cast onto the moon, resulting in an eclipse. So why don't we see a lunar eclipse every month? The answer is simple. The moon's orbit is inclined at 5 degrees from the sun-earth plane, so that each month the moon may be slightly above, or slightly below that plane. And a lunar eclipse will occur only when the three bodies line up on the same plane. Chart Courtesy of NASA. P1=00:11:47UT. U1= 01:07:11UT. U2= 02:11:10UT. U3=03:23:05UT. U4=04:27:03UT. P4=05:22:27UT. The lunar eclipse will be more spectacular than usual, because the moon will be at its closest point as it orbits the earth. This makes it appear about 7% larger than usual, when it takes on the unjustified title of a supermoon. The moon will appear to turn red, as it enters the shadow of the earth, and for this reason it is sometimes called a blood moon. 4 If two brothers were killed at the same time. That's what we have - four causes of a solar eclipse, and none for a lunar eclipse - we are just told that it is a "bad omen for Israel." And how does Rashi explain this passage? לא שמעתי טעם בדבר - "I have not heard any explanation for this." If we know that eclipses are regular celestial events whose timing is predictable and precise, how are we to understand Talmud in Sukkah, which suggests that an eclipse is a divine response to human conduct? We have already seen that Rashi was unable to explain the passage, but that didn't stop others from trying. The Maharal of Prague (d. 1609) has a lengthy explanation which you can read here. It goes something like this: "Yes, an eclipse is a mechanical and predictable event. But in truth, if there was no sin, there would be no eclipses, because God would have designed the universe differently, and in such a sin-free universe...there would be no need to design an eclipse." So the Maharal suggests that in a sin-free universe, the moon would not orbit as it does now, at a 5 degree angle to the sun-earth plane. But where would the moon be? It couldn't be in the same plane as the sun and the earth, since then there would be an solar eclipse every month. If it were at say 20 degrees above the plane, then there would still be both solar and lunar eclipses, though they would be more rare. The only way for there to be no solar eclipses (in the Maharal's sin-free imaginary universe) would be for the moon to orbit the earth at 90 degrees to the sun-earth axis. Then it would never come between the sun and the earth, and there could never be a solar eclipse. Perfect, except then there would never be a Rosh Chodesh, and the moon would always be visible. Oy. Another attempt to explain the Talmud was offered by Jonatan Eybeschutz (d. 1764). In 1751 Eybeschutz was elected as chief rabbi of the Three Communities (Altona, Hamburg, and Wandsbek), and was later accused of being a secret follower of the false messiah Shabtai Zevi. 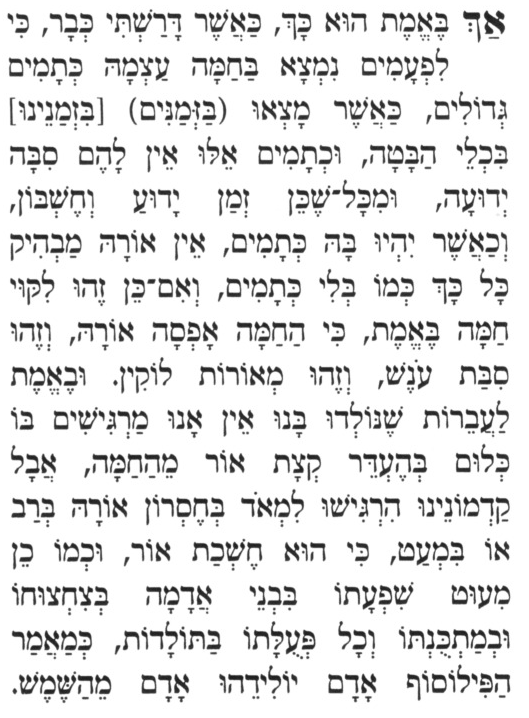 In January 1751, Eybeschutz gave a drasha in Hamburg in which he addressed the very same problem that Maharal had noted: if a solar eclipse is a predictable event, how can it be related to human conduct? His answer was quite different: The Talmud in Sukkah is not actually addressing the phenomenon that we call a solar eclipse. According to Eybeschutz, the phrase in Sukkah "בזמן שהחמה לוקה" actually means - "when there are sunspots." Inventive though this is, it is as implausible as the suggestion of the Maharal. In the first place, sunspots could not have been seen prior to the invention of the telescope. They were first described in March 1611 by a contemporary of Galileo named Christopher Scheiner (though Galileo lost no-time in claiming that he, not Scheiner was the first to correctly interpret what they were.) Because sunspots could not have been seen, this cannot be what the rabbis in Gemara Sukkah were describing. It's interesting to note that Galileo got very excited about the discovery that the spots moved across the face of the sun. This suggested (though it did not prove) that the sun itself was spinning. Galileo had also discovered that Jupiter was orbited by moons. Both of these discoveries now added further support to the Copernican model in which the Earth was spinning on its ownaxis, and was not the center of all the movement of objects in the sky. But Eybeschutz did not believe Copernicus was correct: "Copernicus and his supporters have made fools of themselves when they declare that the Earth orbits [the Sun]. They have left us with a lie, and the truth will bear itself witness that the Earth stands still for ever." Eybeschutz wanted to have sunspots explain away a talmudic mystery, but he dismissed the evidence that they provided in other matters - namely, that the earth moves. This coming Sunday, the first night of Sukkot, those of us on the east coast of the United States will be able to peak the lunar eclipse (weather permitting) as we begin our first meal (weather permitting) in the Sukkah. In Europe and Israel you will need to stay up later, perhaps glancing at the red moon through a now darkened Sukkah. On the west coast of the United States, the moon will be eclipsed as it rises. A lunar eclipse coinciding with Sukkot is not a rare event; the last time it happened was...last year. However, last year's eclipse was not visible to the vast majority of those sitting in their Sukkot, unless you were on the west coast of the US, in Sydney Australia, or crossing the Pacific. But consider this: the next time you'll be able to witness a total lunar eclipse while sitting in your Sukkah will not be until 2033 (for those in Australia, the Pacific, and the western US). For those in western Europe and the eastern US, you will have to wait until 2080. So I plan to enjoy this total eclipse of the the sukkot supermoon, because I won't see another.